TOKYO, July 11, 2018 - (ACN Newswire) - The TRIBRID Project in Indonesia by KDDI and NEDO was registered as an official project under the Joint Crediting Mechanism (JCM), which facilitates diffusion of leading low carbon technologies as well as implementation of mitigation actions, and contributes to sustainable development of Indonesia. In January 2015, KDDI began introducing TRIBRID BTSs in Indonesia as part of an initiative of the Ministry of Economy, Trade and Industry (METI)*1. By January 2018, a NEDO program*2 had completed the adoption of TRIBRID System at 20 BTSs in Indonesia and was moving forward with the Demonstration Project. 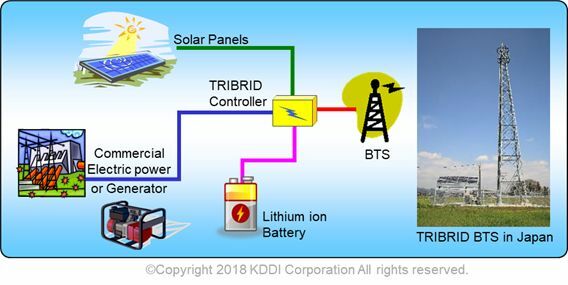 TRIBRID BTSs make efficient use of power by alternating commercial-use power, solar power and late-night battery charging, depending on time of day and weather conditions. KDDI built the first TRIBRID BTS in Japan in December 2009. Since then, the number of TRIBRID BTSs has expanded to 100 nationwide. On July 10th, 2018, "TRIBRID Project" run by NEDO and KDDI in Indonesia was approved and registered as an official project by the Japan-Indonesia JCM*3 Joint Committee. On June 21, 2018, this demonstration project has been recognized as a commemorative project on The 60th Anniversary of Japan-Indonesia Diplomatic Relations*4. 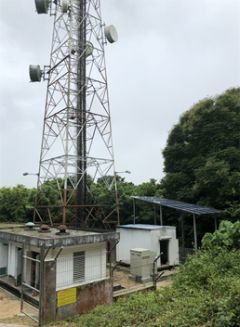 *1 See the KDDI news release issued on Jan. 14, 2015: "KDDI tackles global warming with international TRIBRID base stations"